I did not want to cook an elaborate meal just for one. I had some lovely, firm chestnut mushrooms which I bought in the bio-supermarket and a leek left over from the risotto recipe. Both really lend themselves to a creamy sauce. You can buy soya cream in many supermarkets in the UK and in bio-supermarkets in Germany. It is worth keeping a small carton in the cupboard as it can be used in many dishes and served with fruit as a dessert. Gently heat the oil in a shallow pan and sweat the leeks until they are becoming soft. Add the mushrooms, garlic and curry powder and cook for about 7-8 minutes, stirring occasionally. When the vegetables are cooked, pour in the cream and stir through so that all of the veg are covered. In the meantime prepare the toast. 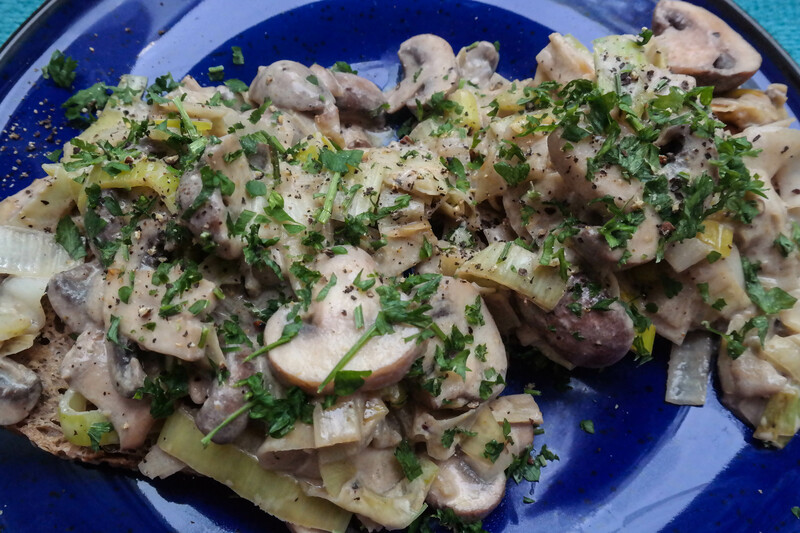 Serve the mushrooms and leeks on top of the toast and garnish with parsley. In the supermarket today, the only decent produce was some huge leeks. I have never made a proper risotto before with Arborio rice. It surpassed my expectations and was quite filling. I picked the rocket and fresh mint from the school garden this afternoon. If you do not want to use wine then you can replace all of the liquid with vegetable stock. This is another recipe where the magic, ground nuts can be used to enrich a dish without the need for cheese.You could also toast some pine nuts to sprinkle on top. Gently sweat the leeks and the garlic in the olive oil until they are very soft. Add the rice and a mixed cupful of wine and water. Stir and keep stirring until the liquid is absorbed. Keep adding the liquid a cupful at a time and stirring until the rice is just soft. Add the peas and mint and stir. Season to taste and the stir through the ground almonds. Place all of the ingredients except the oil in a food processor and blitz until smooth. Drizzle in the olive oil until the pesto binds and forms a smooth paste. Season to taste. 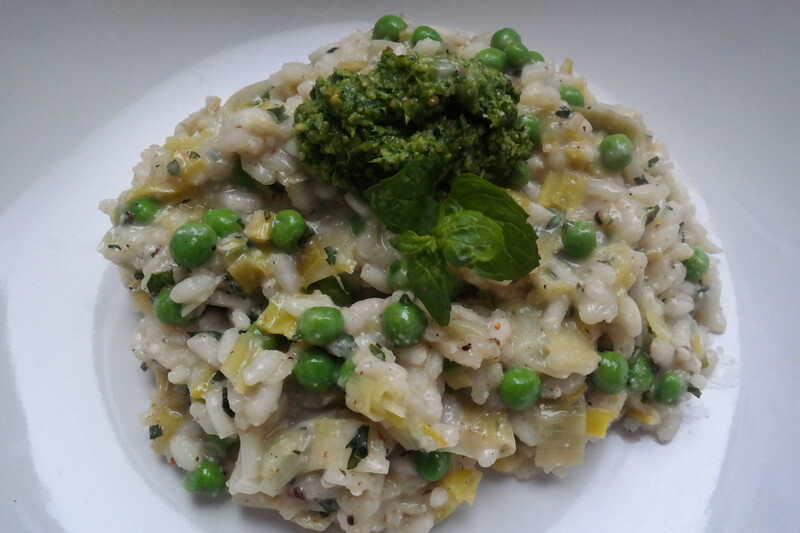 Serve the risotto with a spoonful of the pesto on top.